Is an assistance system that allows you to check the passenger side rear areas displayed on the audio/information screen when the turn signal is activated to the passenger’s side. A camera in the passenger side door mirror monitors these areas and allows you to check for vehicle, in addition to your visual check and use of the passenger door mirror. You can also keep the system on for your convenience while driving. Failure to visually confirm that it is safe to change lanes before doing so may result in a crash and serious injury or death. Like all assistance systems, LaneWatch has limitations. 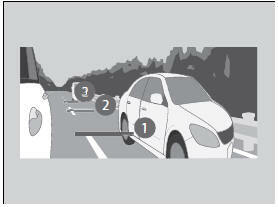 Over reliance on LaneWatch may result in a collision. The LaneWatch camera view is restricted. Its unique lens makes objects on the screen slightly look different from what they are. LaneWatch display does not come on when the shift lever is in (R.
• The camera is located in the passenger side door mirror. Always keep this area clean. If the camera lens is covered with dirt or moisture, use a soft, moist cloth to keep the lens clean and free of debris. • Do not cover the camera lens with labels or stickers of any kind. • Show with Turn Signal: Selects whether LaneWatch monitor comes on when you operate the turn signal light lever. • Reference Lines: Selects whether the reference lines appear on the LaneWatch monitor. 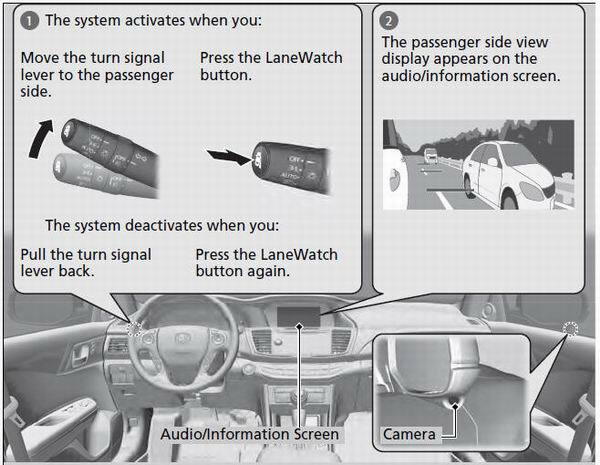 • Next Maneuver Pop up*: Selects whether a turn direction screen of the navigation system interrupts the LaneWatch display. • Display: Adjusts display settings. The distance between your vehicle and lines 1, 2 and 3 on the screen vary depending on road condition and vehicle loading. For example, the reference lines on the screen may seem to appear closer than the actual distances when the rear of your vehicle is more heavily loaded. • The passenger side door mirror, or area around it is severely impacted, resulting in changing the camera angle. • The LaneWatch display does not come on at all.